As a tribute to Delphi’s 22 years birthday, and our own release of our Delphi and C++Builder middleware kbmMW v. 5.00.01 Beta, we have decided to go deep and dirty! 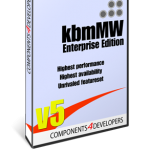 For a very limited time, until March 5 2017, you can get a new license of kbmMW Enterprise Edition, which is our flagship product with a whopping 75% discount! 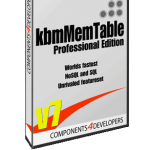 What do you get with kbmMW Enterprise Edition? The most complete n-tier product in existence for Delphi and C++Builder. Period! Complete caching SOA server with loadbalancing, failover and proxying support. Complete support for building your own application server. Complete native and performant XML, JSON, YAML, BSON, Messagepack support. Complete support for serializing and deserializing native Delphi objects to any of the above formats. 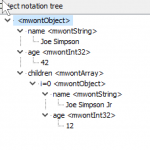 Native XSD importer which generates Delphi objects that can be serialized as described above. 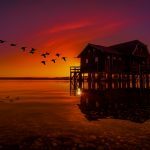 Complete REST support with 5 lines of code. Spring boot inspired on steroids! Native extremely complete transactional queue based publish/subscribe messaging support with high performance memory and file based queues with auto healing functionality. Native high performance multi monitor Remote Desktop server and client code included, allowing creation of products like GotoMyPC, TeamViewer etc. Complete authorization support based on resources, roles and actors. Complete scheduler support for both high precision scheduling of very frequent tasks and scheduling of relaxed precision tasks on minutes, hours, day, monthly or yearly basis. Actually the bullets are of less importance… what is of importance is that you can build absolutely any product requiring a multi tier setup using kbmMW! REST functionality? Takes 5 minutes to have a server running exposing even complex functionality. Native clients? Takes 10 seconds to give them access to the same functionality as above, and you can add more specialized functionality as you need. Cross platform clients? Again… 10 seconds then they are up and running! Add more features while supporting older clients? Complete versioning of functionality is supported! Need secure communication? Implemented in less than a minute, server and client side. Need compression of data over slow lines? Again one minute. You can do it all, and now you can do it DIRT CHEAP! Visit www.components4developers.com to find the link to purchase DIRT CHEAP and to read more about kbmMW.